Submitted by adm1n on Mon, 12/21/2015 - 12:51. The students at Concord Carlisle High School (CCHS) are nearing the winter break, marking the first half of the new School’s inaugural year. The local community was very involved in the process of planning, developing and constructing the building, which provided transparency in the green processes integrated into the School. 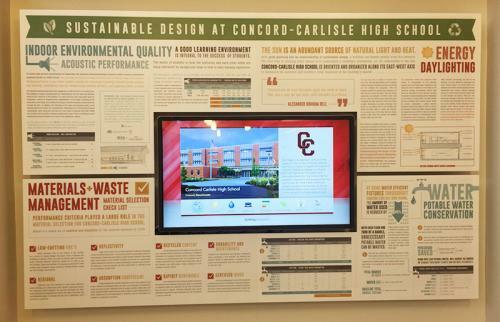 The environmentally friendly initiatives put into place throughout the building are not only common knowledge, but they are also prominently displayed on a full wall of green information about the school near the office. The School itself is progressive and green, which is well known to those with an interest in building practices, the school, and/or sustainability in the community. What is not as well documented, however, is the extent to which several environmentally-focused groups in the School are pushing to educate their peers and the community. One of these groups, the Green Team, is overseen by faculty advisor Mr. Nichol, a popular earth science and environmental science teacher who is dedicated to promoting environmentally conscious values throughout the School. Mr. Nichol can frequently be seen biking to school each morning. Green Team’s current student leaders include Liam Reynolds ‘16, Sam Royce ‘16, Mia Royce ‘17, and Claire Brandhorst ‘17, who took the time to answer a few questions about Green Team, the impact it aims to have, and what it means to be promoting conservation and sustainability. Regarding the initiatives that Green Team has worked on, Claire spoke about a recycling problem at the school. Much of the paper and plastic waste produced at the school was being incorrectly placed in recycling bins, leading to all of it being thrown out instead of effectively being recycled. So, Green Team made signs to label the bins to cut down on waste produced simply out of ignorance. She explained,“It doesn’t seem like that big of a project,” but the impact is large. Waste is more properly disposed of thanks to a few labels, making the group’s work more impactful than one might think. Claire added that this year, the group is working on tackling the problem of milk carton waste. The school lunches at CCHS are almost completely waste free except for the milk cartons that cannot be recycled. These changes may seem small in magnitude, but in a building with over twelve hundred students and faculty, they have a large impact in promoting an environmentally conscious lifestyles. The group also has plans to pursue a composting relationship between the school and the town of Concord so that food waste can become nutrient rich fertilizer. Whether it be recycling milk cartons, or tackling a larger initiative such as school-wide composting, Green Team is doing its part to help educate the community about the environment through conservation and implementing sustainable practices. Claire went on to praise the school for taking steps to make the school green, citing, “There are lots of smaller features of the School which make it more environmentally friendly, such as panels designed to reflect natural light into the classrooms, and air driers in the bathrooms so that not as many paper towels are used.” All of the work Green Team is doing at the School adds up and contributes to the reduction of the School’s overall environmental footprint. Green Team is a small student initiative that does not claim to be single handedly changing the world. However, even with limited resources in the School, the group is making impressive strides to instill the environmentally friendly values that are important to the local community and the culture of CCHS. By promoting small lifestyle changes at the school, the group is cutting down on waste and showing students that a small number of changes can significantly help. Increasingly dire evaluations of our planet and its rising temperatures and sea levels may be frightening, but the solution is to follow the lead of Green Team and do your own, individual part to contribute to shifting the global paradigms surrounding the environment. Conservation and sustainable practices are the new norm, so everybody should join a team like Green Team to unite and promote these practices. Part 1 in a 2 part series profiing the environmentally focused student initiatives at CCHS.